An Extraordinary Day for Raphael Design! Saturday 25th March took an unexpected turn for the two directors of Raphael Design, Pete and Clare Lubrano. The couple had been enjoying a weekend of rock climbing at Portland in Dorset when unfortunately Clare sustained a fall. Pete and Clare realized that a visit to A & E was going to be necessary but the main challenge facing them now was how Clare was going to get back to their car. The walk back was going to involve a good half hour scramble over rocks and cliffs. Despite Clare’s best efforts to give it a go, it was quickly concluded that this was not going to be a possibility. The only option was then to call for help from the emergency services. 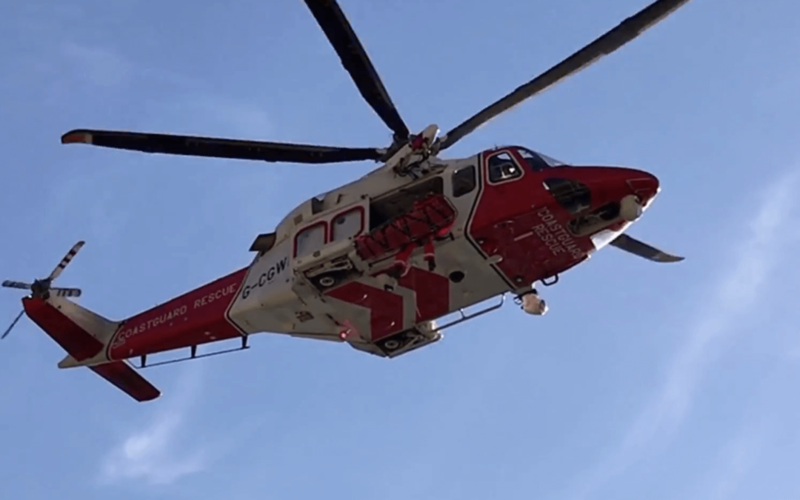 A pair of climbers offered to scramble to higher ground to get a phone signal and before long, several members of the Coastal Rescue team were at the scene and the Portland Rescue helicopter was hovering overhead. ‘The helicopter crew were facing the challenge of lowering one of the crew to where Clare and I were situated, which in effect was like a ‘funnel of rock’. After careful consideration from the pilot, the team paramedic descended on a wire and once on terra firma he cheerily introduced himself as Ryan. Having been flown to safety Clare was then taken to Dorchester hospital where she was diagnosed with a collapsed lung, which was treated with a chest drain. After a two-night stay at the hospital she was discharged and able to travel back home to Staffordshire with Pete. During her stay at the hospital, unbeknown to Clare, she had made the front page of the Dorset Echo with the headline of ‘Rock climber airlifted to hospital after 30ft fall’. Though the article’s version of events was a bit more dramatic that what had actually transpired, local interest in the Portland Coastguard helicopter is high as at the end of June 2017 it is being decommissioned. The Lee-on-Solent helicopter based in Hampshire will, from then on, deal with any requests for search and rescue in the area.